So I've basted everything and made my quilt sandwich. I just don't know how to put it together. Is it okay to "stitch in the ditch" when sewing by hand? I don't have a sewing machine. Or should I do something like this: http://i.imgur.com/rmhvrXx.png Thanks! Welcome to the board!!! 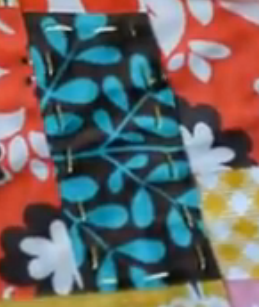 What pattern is you quilt? It is ok to stitch in the ditch if that is the look you like. or it is ok to do the big stitch. it is up to you what, is the look YOU like and what is the stitch that you fill you will like to a lot. It is your quilt and you should do what ever you look with it and if some body tall's you that it is not right. just smile and say thank you for your in put. You can do SID, but I always find it hard, there can be extra fabric to get through. Can we see a picture of your quilt top, or tell us what pattern it is? I stitched in the ditch with my very first quilt. I did have some trouble where the points met and it got a little bulky, but I soldiered on and I think it turned out pretty well. Awesome! Thanks for all the wonderful advice, everyone. I think I'll try SID! All this advice is good advice... I just want to say Have fun!! Let us hear how it goes!? I don't SID but I get fairly close to the seam so I can see the stitches. Am going one now for my DD who usually sends hers out to be LA'd but she asked me to do this one for her MIL. So I guess my hand stitches look okay to her! I have been a handquilter for at least 40 years. The only time I SID is if I a handquilting a cheater's cloth piece. Why bother handquilting if your work is going to be hidden in the seam. I usually quilt about a 1/4 inch on either side of the piecing seams. It reinforces your work and makes the piecing "pop". I also have a large collection of stencils that I use to mark the larger areas. It is the "quilting" that makes it a quilt so why not show it off. Welcome to the wonderful world of hand quilting! Everyone is correct, it is YOUR quilt and you can do it any way you want to. As you do more hand quilting, you will find the things that work best for you. Everyone has their own methods and you will find your own too. The only other advice I have is to try new things as you go. Don't get stuck in the "I've always done it this way" trap. Keep learning and growing. ENJOY!!! Why bother handquilting if your work is going to be hidden in the seam. I usually quilt about a 1/4 inch on either side of the piecing seams. It reinforces your work and makes the piecing "pop". I also have a large collection of stencils that I use to mark the larger areas. It is the "quilting" that makes it a quilt so why not show it off. I agree whole heartedly. I used 1/4" painters tape laid next to the seam and quilted right next to that. After a while I could pretty much guage the 1/4" by eye but the tape helps you to keep it nice and straight. Why go to all that work if your stitching won't even show. Come away from the ditch a bit and I bet you will be well pleased with the result. This is pretty much my take on hand quilting. I have never done stitch in the ditch. Also use the 1/4 in on either side of seam, and stencils for larger areas. This works for me, but may not for you. Try a couple samples and enjoy.